I am pleased to present this, my 7threport as Chairman of the Parish Council. The Clerk, who has been with the Council for many years, has reminded me that planning and transport have always been the top issues in Chairmen’s reports over the years. 2018/19 has been no exception. Planning, in its various guises, has been a particularly challenging subject locally in the past year. Aside from some specific sites, the District Council’s Local Plan has been a prominent issue in the year. I have explained in previous years that this is a required plan, against which development control – ie planning applications for particular sites – is measured. It has to be said that the District Council is somewhat behind the game in the preparation of a “modern” local plan. It is still operating under the version adopted in 2006 and a Core Strategy ratified in 2012, which weakens its position when seeking, for instance, to fend off developers, speculative or otherwise. After many years of work, the District Council was on track to approve its Local Plan last summer. It is true that the draft then before that Council did not have unanimous support. It was, however, a surprise that, following internal disagreements within the controlling political group, the draft was thrown out by the District Council at the eleventh hour. This iteration of the draft did not envisage any significant development in the Parish. It then emerged that the District Council had decided to do more work to determine the most suitable locations for strategic development, before submitting the Local Plan to Government. It decided to look again at all available sites for major housing development, including sites already proposed in the Plan, previously considered, but dismissed, sites and some additional sites, which had not previously been the subject of consultation. 15 potential sites for strategic allocations were identified, including 2 in the Parish – Reading Golf Club (extending to Chalkhouse Green) and Palmers Riding Stables, Emmer Green. Following a very rare special meeting of the Parish Council – our monthly meetings usually provide an adequate framework for the efficient discharge of our responsibilities – it was decided to express disappointment and concerns about the inclusion of Reading Golf Club and Palmers Riding School in the review of additional sites in relation to the Plan. These concerns were set out in a letter I sent to the Leader of the District Council. You may have read it on our website. I was disappointed, as were my fellow councilors, at the somewhat dismissive reply received on behalf of the Leader of the District Council. Iain Pearson, one of my fellow councilors, attended a meeting of the District Council’s Cabinet meeting in August and addressed councillors about the Parish Council’s concerns. I attended the full District Council meeting in September, in the same vein. This “pressure” resulted in a better explained and argued response from the District Council’s Head of Planning. You will all have no doubt read that, eventually, the District Council adopted – in December last year – another version of its Local Plan, which is now out for consultation. It does not include the sites in the Parish, which I mention, above as suitable for development … In very general terms, the current draft is more favourable to the Parish. However, it does contain a number of anomalies, and your Council has taken the opportunity to draw these to the attention of the District Council, via the consultation exercise. I referred last year to the preparation of the Kidmore End Neighbourhood Development Plan (NDP): I will report separately on that shortly this evening. In the meantime, suffice it to say that the vacillation by the District Council about the Local Plan has delayed progress on the NDP, not the least because the Steering Group is having to review all the policies drafted for the NDP and the 7 months’ uncertainty about the strategic site allocation in the draft Local Plan. At the other end of the telescope, we now have to address the draft Oxfordshire Plan 2050. This sounds remarkably like the old County Structure Plan which met its demise in the first decade of this century: if you stick around long enough, apparently outmoded devices come back into fashion! This derives from the deal struck by the County Council, the Oxford City Council and the 4 district councils with the Government – the Oxfordshire Housing and Growth Deal. Under this arrangement, the Government has guaranteed funding on affordable housing, infrastructure and economic growth in the County. The Plan is designed to guide development in the area up to year 2050. The general feeling is that the Plan is predicated on much greater economic and housing growth than has been envisaged thus far in, say, the South Oxfordshire Local Plan. This chimes with the Oxford to Cambridge Expressway corridor, another area of potential high growth. On paper, the Oxfordshire Plan will have little impact geographically on the Parish, as much of the growth is envisaged in the greater Oxford area. But increases in required housing provision will inevitably impact on the Local Plan. Consultation on the first stage of the Oxfordshire Plan opened on 11 February and will close on 25 March 2019. Your Council will decide how to respond to the consultation later tonight. If you have thoughts on the matter, please take the opportunity to send comments to the Oxfordshire Plan Team at County Hall. As to planning appeals, there have been 3 relating to the Parish, or sites nearby, determined in the past year. All 3 were dismissed – the Gladman development at Bryants Farm, Emmer Green (actually in the Parish of Eye & Dunsden), 95 houses on land off Kennylands Road, Sonning Common (in Sonning Common), and 10 to 14 houses at The Elms, Tokers Green Lane, Tokers Green. The proposed Gladman development is or was something of a cause celebre. The Council joined other parish councils and residents groups to form CAGE (Campaign Against Gladman in Eye & Dunsden). CAGE raised enough money to hire a barrister to appear for it at the appeal inquiry, and a good job he, the District Council’s barrister and witnesses did, too. However, Gladman have not given up yet. They sought leave of the High Court for judicial review of the inspector’s decision. This was rejected by the Court. They are now seeking an oral hearing in the Appeal Court. Incidentally, the District Council announced, on the eve of the Gladman inquiry, that it had a housing land supply to cover the next 5.4 years. This means that the presumption in favour of sustainable development in the National Planning Policy Framework no longer applies in South Oxfordshire. This rather brilliant news largely blew Galdman’s case out of the water! The decision in respect of The Elms was welcome news, too. The part of Reading Golf Club in the Parish. Your Council was particularly pleased about the order for the Golf Club, as it had requested that the trees be protected. We are, of course, watching developments at the Golf Club carefully. Suffice it to say, there have been no planning applications yet to develop any part of the site, either in Reading or South Oxfordshire. Your Council has identified a number of cases where buildings have been put up, or uses of the land changed, with no obvious planning permission. The District Council has been looking into them, and is pursuing those where there may have been breaches of planning control. The Council continues to pursue its ambition, to secure the inclusion of the whole of the Parish in the Chiltern Area of Outstanding Natural Beauty (AONB), during the year. Achieving this would ensure a regime of planning restraint throughout the Parish. Unfortunately, this seems no nearer to a successful outcome than it was in my report last year. We have, as a result, with other parish councils, asked John Howell MP to press for consideration of the application within Government Departments. In the meantime, a landscape study undertaken in connection with the NDP has validated the Council’s assertion about the similarity of the landscape in the Parish, both inside and out of the AONB. As I said earlier, the other significant issue over the past year has been the roads and traffic in the Parish. I reported last year that your Council had secured the reduction of the speed limit in Kidmore End village to 20mph. All the other settlements in the Parish, except Cane End, are covered by 30mph limits, following a policy decision of the County Council some 20 to 30 years ago. Your Council has no statutory authority to tackle traffic speeds – that is a matter for the County Council, who impose speed limits, and the Police, who enforce them. However, we have to acknowledge that the years of austerity have had an impact on the ability of either organization to take action on the matter. The speed of vehicles remains a particular issue in the Horsepond Road, Gallowstree Common. Residents of that village argue that many vehicles pass through it at speeds above the speed limit, despite, for instance, the vehicle activated speed indicator device installed at the request, and expense, of your Council, a few years ago. Your Council has embarked on 2 schemes to help tackle this. The first is the production, in collaboration with Kidmore End School, of posters calling for drivers to abide by the speed limit, for the safety of all road users. You probably saw the recent article in the “Henley Standard” about this. The posters will appear in all villages – they are tailored to the 3 speed limits applying to the settlements in the Parish – soon. In addition, some of my colleague councillors have been trained to use the vehicle speed indicator apparatus available from the Police. They will be deploying it in the Parish in the next week or 2. The data captured by the exercise will be passed to the Police. My colleagues would welcome volunteers to support the activity, and, indeed, would be pleased to arrange for training for further “operators”. The issue of traffic in the unclassified roads in the Parish arising from the successful primary school in Kidmore End remains high on the agenda. A combination of circumstances on one day a few months ago led to mayhem in Kidmore End at the end of the school day. It was all very unfortunate. There is no easy resolution to the parking issues, because the School is an important part of the infrastructure which helps to ensure a vibrant village and Parish. However, your Council and School are in contact about this issue and review all thoughts on how to improve the situation. Your Council has also passed on to the County Council concerns about traffic in the Parish, eg heavy lorries using Mill Lane, and Tokers Green Lane to the boundary with Reading. There are other perennial concerns about the condition of roads in the Parish, although the County Council has, over the past year, upped its game in respect of remedial work. 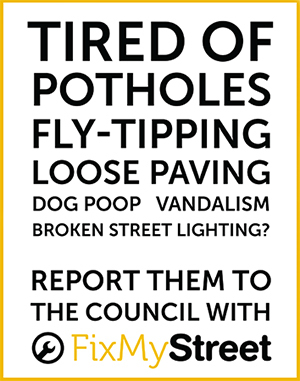 As ever, it would help immeasurably if individuals reported the defects they see to the County Council direct, via the FixMyStreet link on the County Council’s website. This is for 2 reasons. The first is that the earlier the defect is reported, the sooner it is likely to be rectified. The second is that the highway authority has no legal defence, when a claim is submitted, if a defect has been previously reported to it but has not been repaired. In this connection, a resident of Kidmore End has applied to be a “Superuser” in respect of potholes and other road defects. She will report those that meet the criteria for intervention direct to the County Council, who will arrange for the repair without sending a member of staff out to inspect them first. This should lead to quicker repairs. I reported last year that your Council had taken took over the maintenance of highway verges, in the Parish, with the exception of the A4074 road through Cane End, the work being undertaken by Ian Kendrick Ltd. Last summer, the verges were not a problem, and I hope that we do not have a repeat of 2017 this year. However, if you think that certain verges need cutting this year, please contact the Parish Council via our website. It is important to note that your Council does not, however, have any duties in respect of roadside hedges. These are the responsibility of the owner or occupier of the land on which they grow, and I am grateful to those people who have cut back their hedges this winter. However, if hedges start to impede use of the road, please report them to the County Council, using FixMyStreet, as mentioned above. Turning to the other infrastructure in the Parish, the Council owns the Recreation Ground at Gallowstree Common and the Play Area at Kidmore End. The Recreation Ground is managed, on the Council’s behalf, by the Kidmore End Playing Fields Committee, a registered charity. The Chairman of the Committee will report to you later in this meeting. The Council, however, directly manages the children’s play area at that location. Following the investment programme of recent years, the play areas are in good shape. We are, however, about to replace the play house at Kidmore End, with the aid of a generous grant from the County Councillor, Kevin Bulmer, from funds at his disposal. Your Council also owns the wells at Gallowstree Common and Kidmore End, the ponds at Kidmore End and Tokers Green, and the former telephone kiosks at Cane End, Chalkhouse Green and Kidmore End. I am sure that you will join me in thanking Mr & Mrs McAslan of Kidmore End for their work to restore the Kidmore End kiosk. We are still sorting out what to do with the kiosks in the longer term. The Council manages the allotments in the Parish, at Cane End and Gallowstree Common, provided in the 19thcentury Enclosure Awards. The Allotments’ Manager, Sarah Hall, will report later, but I will pre-empt her report to say that all plots are let, and that the water supply at Cane End is imminent (at last!). The Council will have extra funds to help improve the infrastructure in the Parish as the years go by, as it will receive 15% of the Community Infrastructure Levy raised by the District Council from new houses built in the Parish. That percentage will rise to 25% when the NDP is adopted. 3 current development alone – the houses on the site of the former Palm Tree Restaurant at Cane End, the houses at 3 Hazelmoor Lane, Gallowstree Common and those at Beechwood, Tokers Green – will deliver about £32,000, which is almost as much as the Council’s annual precept. The Council cannot use the money to reduce Council Tax – it has to be spent on improvements to the infrastructure of the Parish, or nearby. Your Council will discuss this matter at its meeting later this evening, when I expect it will decide to ask you what you want the money spent on. We look forward to hear what you suggest. On the subject of infrastructure, BT and Better Broadband Oxfordshire have almost completed the network of fibre optic cables in the Parish, to make better Broadband speeds available. In the past year, the cables have reached Chalkhouse Green and Tokers Green. We hope to hear soon that the cabinet in Cane End has been linked up. I hope you all feel the temporary road closures have been worth it! It remains to be seen how effective the exercise is. When all the cabinets are “live”, the Council would like to explore if there are any households who, probably because of geography, still have problems with Broadband speeds. The Council has made modest budgetary provision to help find solutions in those cases. All of your Council’s activities are funded from the Council Tax, collected by the District Council. The Parish Council’s element of the Tax was £55.18 in 2018/19 for an average (Band D) dwelling – just over £1 per week. As you will soon see from your bills, if it has not already arrived, the Council’s element of the Tax has risen to £56.18 for 2018/19, for the average dwelling. I think this will prove to be very much below the average parish or town council precept across South Oxfordshire, which figure has yet to be published. I hope you will agree with me that this represents excellent value for money. Much of what I have said above has been reported already in the Parish Newsletter or on the website. In this connection, I would express my gratitude, on your behalf, to the Newsletter editorial team – Caroline Aldridge, Andy Miros, Ana O’Reilly and Jackie Russell (together, of course, with distributors!) – and to the webmaster – Ana O’Reilly. Our website is much admired by neighbouring parish councils! There have been some changes of councillor since my last report. Sheila Forde resigned, for health reasons, but we were pleased to co-opt Andy Gitsham from Tokers Green. However, there remain only 9 of us – a full complement would be 12, but we have not enjoyed that since the summer of 2015. Turning to our County and District counterparts, Kevin Bulmer, the county councillor, invariably sends us a report each month, and sometimes visits our meetings. Robert Simister, the district councillor, resigned in January, for work reasons. Robert has been very supportive of the Parish and its communities over the past nearly 8 years – he was first elected as “our” district councillor in May 2011, and we would like to thank him for that support. There will be an election for parish councillors in May. There will be a poll on 2 May if there are more than 10 candidates: the Council is being reduced in size, at our suggestion. The closing date for nominations, which have to be delivered by hand to the District Council, is 3 April. If you want to join the Council – and it would good to see some new faces, and some from Cane End and Gallowstree Common – download a nomination paper from the Electoral Commission’s website (www.electoralcommission.org.uk) and get it submitted. I should like to thank my fellow councilors for their unstinting support for you and the 5 communities in the Parish over the past 12 months. They are all volunteers, receiving no payments whatsoever, unlike their counterparts at the County and District Councils. They are vital to help sustain the buoyant communities in the Parish. I would also like to thank the Clerk to the Council for his support and advice over the years.